A fusion of a pineapple and a deer, formed in Arcane River, a dimension where the Black Mage was able to merge Maple World, Grandis, and FriendStory. Found at Chu Chu Island's Five-Color Hill, an area which requires 100 Arcane Power to deal full damage. Attacks by charging into you. A fusion of a banana and a ram (a male sheep), formed in Arcane River, a dimension where the Black Mage was able to merge Maple World, Grandis, and FriendStory. Found at Chu Chu Island's Five-Color Hill, an area which requires 100 Arcane Power to deal full damage. Attacks by slamming its front legs into you. A corrupted tree sap monster found near the lower stems of the Dark World Tree. 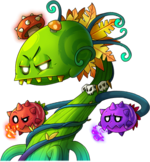 Attacks by spiking its body, as well as spreading poison gas. A giant android carrier found on the Skyline near Edelstein's Scrapyard. It does not attack you, but its speed increases upon sighting a player. 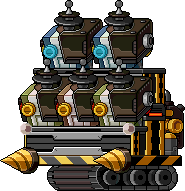 Upon death, it spawns 1 Modded Scaredroid, 2 Modded Broken Androids, and 2 Modded Laseroids. A fusion of an apple and a wolf formed in Arcane River, a dimension where the Black Mage was able to merge Maple World, Grandis, and FriendStory. Found at Chu Chu Island's Slurpy Forest, an area which requires 100 Arcane Power to deal full damage. Attacks by turning into an apple and bouncing on you. A fusion of a flower and a lion formed in Arcane River, a dimension where the Black Mage was able to merge Maple World, Grandis, and FriendStory. Found at Chu Chu Island's Slurpy Forest, an area which requires 100 Arcane Power to deal full damage. Attacks by punching the ground. A giant android head with 3 androids hiding under it, found on the Skyline near Edelstein's Scrapyard. It attacks by firing a laser from its eyes. 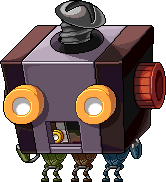 Upon death, it spawns 1 Modded Scaredroid, 1 Modded Broken Android, and 1 Modded Laseroid. A fusion of a cat and a fish formed in Arcane River, a dimension where the Black Mage was able to merge Maple World, Grandis, and FriendStory. Found at Chu Chu Island's Eree Valley, an area which requires 130 Arcane Power to deal full damage. Attacks by blowing air at you. A fusion of a rhinoceros and a turtle formed in Arcane River, a dimension where the Black Mage was able to merge Maple World, Grandis, and FriendStory. Found at Chu Chu Island's Eree Valley, an area which requires 130 Arcane Power to deal full damage. Attacks by pushing into you with its nose. One of Damien's soldiers. Attacks by swinging his sword at you. Found near the lower-middle stems of the Dark World Tree. An android with a laser arm found near Edelstein's Scrapyard. A red android with missiles found on the Skyline near Edelstein's Scrapyard. When it launches missiles, there will be a warning on the ground, and if you stand within the targeted area, you will take 10% damage. 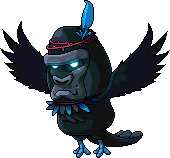 A fusion of a crow and a gorilla formed in Arcane River, a dimension where the Black Mage was able to merge Maple World, Grandis, and FriendStory. Found at Chu Chu Island's Skywhale Mountain, an area which requires 160 Arcane Power to deal full damage. Attacks by roaring at you up close and firing a gust of wind at you from afar. A guard android found on the Black Heaven Deck near Edelstein's Scrapyard. It attacks by electrocuting you. 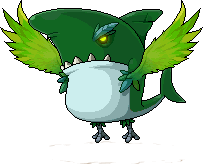 A fusion of a bird and a shark formed in Arcane River, a dimension where the Black Mage was able to merge Maple World, Grandis, and FriendStory. Found at Chu Chu Island's Skywhale Mountain, an area which requires 160 Arcane Power to deal full damage. Attacks by chomping at you up close and firing a shark-shaped projectile at you from afar. A fast-flying version of Birdshark. Found in every hunting ground at Chu Chu Island. These will automatically follow you upon entering a map and deal 10% of your HP as touch damage, as well as lock your ability to use potions, so don't go AFK! Reappears 5 minutes after being defeated. 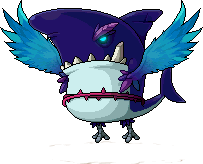 The final boss of Chu Chu Island, which drops a fruit needed to perfect the sandwich for Muto. It can create roses on the ground that indicate spots where a spiked vine will pop out of the ground to hurt you. It can also slam into the ground. One of Damien's soldiers, corrupted by the power of the Spirit of Vengeance which once empowered Damien. Attacks by swinging his sword at you. Found near the lower-middle stems of the Dark World Tree. One of Damien's soldiers. Attacks by swinging his axe at you. Found near the upper-middle stems of the Dark World Tree. A blue android with missiles found on the Black Heaven Deck near Edelstein's Scrapyard. When it launches missiles, there will be a warning on the ground, and if you stand within the targeted area, you will take 20% damage. A mysterious outlaw with a paper bag on its head. Formed by Lucid in Lachelein, the city of dreams, a part of Arcane River, a dimension where the Black Mage was able to merge Maple World, Grandis, and FriendStory. Found in Lachelein's Alley, an area which requires 190 Arcane Power to deal full damage. Attacks by clawing at you. This page was last edited on 17 March 2018, at 03:52. This page has been accessed 10,564 times.